This simple red bean mochi recipe was passed from my friend and tested with success many times. The chewy texture is just right with the not-so-sweet red bean fillings. Mochi is one of our family’s favourite desserts which is a Japanese rice cake made of glutinous rice. One of the many Japanese confections such as daifuku, that is mochi stuffed with sweet fillings, like sweetened red bean paste, is very popular around the world. You can stuff any other sweet fillings you like in mochi. No wonder mochi is widely welcome by different people with different tastes. Its sticky texture is a challenge to handle. My good friend, Juanna, gave this mochi recipe to me. I found it’s simple and easy to follow. I tried several times. Every time my family and I were very satisfied with the results. Many thanks to her. Wear a pair of food-grade plastic gloves first. Then you'll find it's much easier to handle and wrap the fillings with the sticky dough. Combine glutinous rice flour with sugar well. Gradually stir in coconut milk (or milk) until smooth. Transfer flour mixture in a greased shallow plate (see picture 1), steam over high heat with cover for 30 minutes, or until cooked through (see picture 2). Use a chop stick to test if it’s cooked. If not much flour mixture sticks to the chop stick, it’s done. Let cool down a bit until you don’t feel too hot to handle. Transfer to a greased surface. Cut into 12 even small portions. Knead each into a small disc. 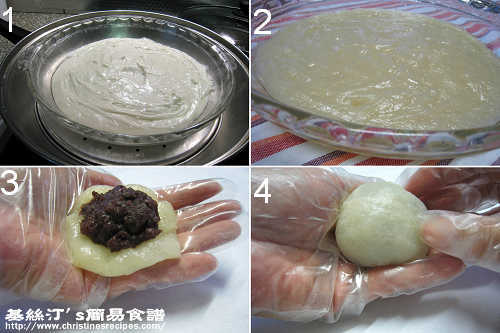 Spoon red bean paste in the middle (see picture 3). Fold the edge to seal the mochi. Lightly roll it into a ball shape using both palms, then coat with desiccated coconut. The alternative way to coat mochi is to use cooked glutinous rice flour. Fry some extra glutinous rice flour on a non-stick frying-pan over medium-low heat without any oil. Let it cook for 3 minutes until aromatic. Don’t let it burn by all means. After the cooked flour cools down a bit, you can use it to coat mochi. Rinse red beans and soak for 3 hours. Drain well. Add red beans in boiling water to cook over medium-low heat with cover until soften. The proportion of red beans and water I usually follow is 1:3, and cook over my electric ceramic stove. When all the water is vaporized, the red beans are cooked, resulting with very soft texture, yet sustaining the whole shape of red bean. I just love this kind of red bean paste, not too hard but not too soggy. While half the water is gone, add rock sugar to taste. When it’s almost done, taste by yourself to adjust the sweetness of the red bean paste. Add some raw sugar to adjust the sweetness if needed. The plate you use to steam glutinous rice flour should be big and shallow. Spread flour mixture thin in it. Otherwise it takes forever to be cooked through. Glutinous rice flour is pretty sticky in its own nature even when is cooked. If the flour is steamed for enough time, it’s all right even though it still sticks to your chopstick a bit. If you don’t taste any uncooked-flour flavour, it’s cooked and can use it to wrap fillings. This looks sooooooooooooooooooooooooooooooooooooo good!! I wish I can take it off my computer screen and eat it right now...lol! Great job! i love this! we have a similar delicacy in the philippines (chinese) called buchi, but it's deep fried.. i wonder how mochi would taste deep fried, huh? Glad you like this mochi. How long can this mochi last? Will it remain the same freshness and texture as the day it is made?And how can I store it? i was wondering if you can use a microwave to steam the flour mixture? and how long would i need to put it in? It could remain the same freshness for 1 to 2 days in airtight container. 2 minutes on high heat, remove and stir well, another 2 minutes on high until completely translucent. Please note that the power of every microwave is quite different. Adjust the cooking time. Hi, I tried making this while reading another recipe which calls for "Sweet rice flour" which I think is Mochiko. So I substituted glutinous rice flour for it and I used the microwave method. However, when I checked on it, it formed a cakey mass. What am I doing wrong?? What did you add into the glutinous rice flour? How long did you cook with what temperature? What did you mean by "cakey mass"? Was it still runny or something? It was glutinous rice flour + icing sugar (because I didn't have regular sugar). I microwaved it on high for 2 mins. And it puffed up and turned cakey/airy and kind of hard. Hmmm... Could it be the problem of icing sugar? Hi, May I know what do you use to grease the mochi? Just use any vegetable oil or olive oil, only a little bit to prevent from sticking onto the plate. Hello i was wondering how much 220gm of glutinous rice flour is equal to in cup measurement . I found the sticky flour quite hard to handle - any tips? Let it cool down before wrapping. Rub your hands and sprinkle the surface of your working area with plenty of cooked glutinous rice flour. Aw, thanks - I've been wanting to try mochi myself; this looks very doable (and yummy, of course)! can you substitute the coconut milk with water? will it taste (mostly) the same/cook the same? Oh, gosh, just come back and read your message. If the surface of mochi gets too oily, it's quite hard to seal it. Try to turn the inside out, or damp with some water to see if it can help. 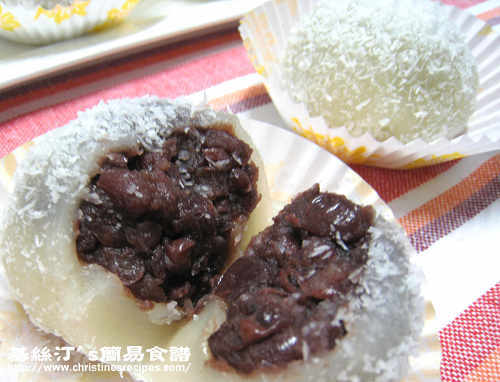 I just tried this today but substituted red bean paste with crushed nuts+caster sugar as the filling. Coated with glutinous flour instead of coconut. Turned out very well. Thank you so much for the recipe! is there a difference between glutinous rice flour and fried glutinous rice flour, i think i got the later one. can't remember why i bought it for. i think for snow skin mooncake. is it okay to use the fried one for mochi? The fried glutinous rice flour is normally used as the filling of some chinese desserts. You can use them to make mochi though. The texture might be slightly different. They are only cooked, still glutinous rice flour. can i use icing sugar to prevent it from sticking instead of cooked flour? What happens if you use rice flour or sweet potato flour? Can they be substituted? The texture would be totally different. I think you can replace with icing sugar. But you have to wait until the mochi completely cools down, then the icing sugar won't be melted away. 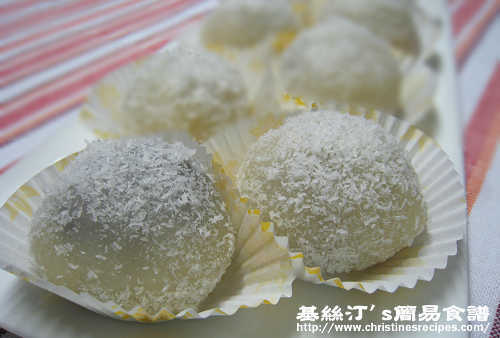 I've been looking/searching in so many websites on how to make mochi... thanks.. I found it now. Yes, you can. Canned beans are handy. I'm looking forward to trying this recipe... but I haven't tried red bean paste before, is it possible to explain its flavor? The red bean paste is sweet. You might use the canned ones from Asian grocery stores or homemade ones for this recipe. I have just plain rice flour...is this ok to use? Also, any other filling suggestions? I like the bean but thought other flavors would be nice too. Think I've had them with peanuts & browned coconut. Hmm...not sure if comment went through. I have sweet rice flour...is that the same as glutinous rice flour? Also, any suggestions for other filling. Think I had one with peanuts & roasted coconut. Like the beans but would like to try others as well. Thank you!! Plain rice flour is very different from glutinous rice flour. You can't get the same texture you expect in mochi if you use plain flour. No other kind of flour can replace the glutinous rice flour used for this recipe, I'm afraid. But for the fillings, peanuts & roasted coconut would be great. I used them to make fillings for mochi before. Just wondering if the Rock Sugar you say about using is Rock Candy? I cant find Rock Sugar anywhere, everywhere is telling me to use rock candy? this recipe sounds fantastic. i absolutely adore Mochi (i eat plates and plates of it when i go to sushi places) so this is wonderful for me! i'll definitely be trying this asap. thank you so much! Thank you. The coconut milk and grated coconut is a good idea. I made mochi balls without them - they were ok. I'll make this next week... Can't wait. I'm going to try this this weekend - thanks! What kind of red beans did you use? Kidney beans? Or the tinier ones found in Asian markets as used in red bean soup? Thanks! Neither the Kidney beans (紅腰豆), nor the very little tiny ones (赤小豆). I used the round ones (紅豆) that are easily found in Asian markets. thank u 4 this dessert. could u please give more information about the Rock Sugar? is the regular white sugar that usually used in coffee will do? Here's the picture of rock sugar (on the left). You can get it from any Asian grocers. You can use white sugar of course. The taste of rock sugar is very nature, that's why I used it. Yummy Mochi! I have a lot of problem with the sticky dough, even with using flour and oil. Does the special gloves help with stickiness? The plastic gloves did help a lot from sticking flour to my hands, and kept food clean too. I just made a batch, 6 with red bean paste, 6 with crushed peanuts and sugar. They turned out good =). The dough is really sticky though, which made it hard to seal the mochi; could not put as much filling into each mochi as you. I wish we had seen your recipe earlier. We just made some of these mochi using bagged red bean paste from the supermarket. It was great but I am sure the freshly made bean paste would be even better! I love these cakes. Very tasty. I gotta try it soon. Thanks for sharing! Can I really trust a recipe that uses the wrong abbreviation for grams? Are you asking about I use "gm" as the abbreviation for grams? Can I? The famous, popular food magazine Gourmet Traveller http://gourmettraveller.com.au... also use "gm". I definitely trust all the recipes published in the magazine for sure. Thanks, love mochi.. do you do a custard flavour too? Lovely mochi! I'd like to use cooked glutinous flour but don't know where to buy it. Could I cook it myself and how? You can just cook it on a fry pan without any oil, over low heat for 8 to 10 minutes, or until it turns a bit yellow. Stir consistently and don't let it gets burnt. That's it. Love your blog, wanted to know if I wanted to do Mochi with peanuts and sesame with coconut how much filling do you recommend I make up? I was also thinking of putting some pandan paste in the Mochi skin mix. Is Mochiko Sweet Rice Flour the same as Glutinous Rice Flour? Do you cover the dough when steaming? Thank you!!! Very similar, both of them are made from glutinous rice. But, is your Mochiko flour sweetened? The glutinous rice flour I used is not sweet. When I steamed the dough, I put on a wok lid only. Hey Christine. These look delicious! I was wondering. Is it possible for you to make a video of how to make the red bean paste? I would like to know how thick it would have to boe. It would be very much appreciated. I love red bean mochi, and I've been using canned red bean paste, but I'd like to make a homemade one, with one not being to runny. I like mines more on the thicker side. Thanks again! Hi Christine, can you give more tips on how to work with the sticky dough? I'd tried the oil/gloves, as well as using cornstarch, to prevent from sticking. Both methods turn out disastrous. My fillings were leaking out and dough is very difficult to work with. They were very yummy but not pretty like yours. Thank you. instead of steaming it in a pot, can i just cook it in the microwave oven? My friend always cooks this mochi with her microwave. It works wonderful too. But I like steaming. hey . i want to make mochi for the first time. but i dont want to make it with the bean paste in it. can you tell me what else i can put in it and how? You can put anything you like as the fillings, like black sesame paste, peanuts and sugar, mango or others. Hi. Can i use this recipe for a ice cream filling as well? Much recipes i found on other sites call for freezing the flour mixture before putting the ice cream. Is is the same with this recipe? Sorry, I haven't tried to wrap ice cream with this mochi skin. Might be quite a challenge. I made mochi tonight using this recipe and it turned out very well, was simple to follow as well as had a great taste. I think I may have over cooked mine a little bit since it was not as sticky as I had anticipated and a few of them were not very stretchy. A wonderful simple recipe though. Over all I give it an A+. Made this recipe tonight with bob's red mill sweet rice flour. Worked out well. I think I steamed it a little longer than recommended. I, too, had trouble making it into nicely shaped balls once filled with the beans and only ended up using half the beans. Maybe I should have used a rolling pin to flatten out the skin a little more?